My name is Pablo Cabo, I’m from Spain. I’m 34 right now. I work as a jiu jitsu coach and I have other things aside because it is hard to live just from jiu jitsu. When your BJJ journey begin? How did you find out about bjj? My Bjj journey begun in Spain, Malaga. It was a friend of mine who invited me to go to his Brazilian Jiu Jitsu Academy. We were at the university and we were playing, I was enjoying grappling with him. Then he told me like, jiu jitsu is gonna be good for you, it’s gonna work for you. So I decided to visit one jiu jitsu Academy and since then I fell in love with jiu jitsu and until today I have been practicing jiu jitsu nearly every day. Where did you train? Tell us more about the academies where you have be trained? I have trained mainly in Spain. But when I was a blue belt I decided to go to Brazil to train a bit more and to prepare for some tournaments. So it was like my first contact with like to train outside of Spain. And after that years ago I decided to move to England to train with Roger. So it was a great experience. I have trained in a lot of academies, I have a lot of friends, to teach and everything. But this are the two main places, the Gracie Barra in Bello Horizonte, where Draculino used to teach,it is a really good academy. And the other one is the Roger Gracie academy the HQ in London, where I have been training in the last years and where I got my black belt. Tell us more about Malaga, Spain and why you choose it over California ? Malaga, in my opinion is the California of Europe. You know, you’ve got an amazing weather, Malaga is not a big city it’s a small city, but at the same time is very international, because we have people from everywhere here. The city is a city to move, to stay, because it is cheap to eat, to live. The weather makes everything easier, you know, we have more than 300 sunny days in the year. And the temperature doesn’t drop too much, so it’s a good city to live. There are only few things that we can envy California, so I’m happy to live here. Tell us more about your gym? The gym, it was like an idea that was growing when I was training, when I was purple belt, brown belt. And then it became reality, you know, it became real. The idea was like, Costa del Sol fight and fitness to have like this martial arts and the fitness side as well. We have been working for the last 7 years here, now we are going to do some changes, but I think it’s going to be for better. You have kids classes, how challenging is to teach kids? Man, to teach kids is always fun, you know, I don’t see it as a challenge, because I love to teach kids even more. At the end of the day, we are teaching them, at the same time we are educating them, we are trying to make them be better son, better student, better citizen, everything. So we try to transmit the values of jiu jitsu to them. Sometimes it is hard time, but you know, I like to play with them, I like to enjoy the time with them, and they end up learning a lot and enjoying and that’s the main thing. So, things change, even your goals change during the years. So these days we are working on the Global fight system management, the Grading system, the Ground. Few more projects, like the online store, so there is a lot of things coming up, there is a lot of things ahead. 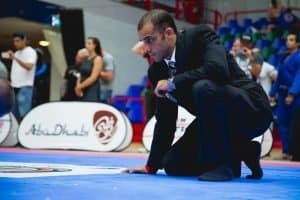 You are a referee, what do you think about competitions in jiu jitsu ? I mean, jiu jitsu is a great sport, but always will be martial art. You know it is based on self defense and all those things. But at the same time, the new side of jiu jitsu was related to competitions, points, advantages. As a referee sometimes it’s hard and the reason why the rules were made, to be more simple for refs as well. In order to identify who is the guy who is winning or even how you are going to score, like whenever there is no points. So this is why the advantages came up. At the same time we have to be very careful of how competition is taking jiu jitsu to different perspective of how it was. Few years ago I didn’t understand this too much but now it makes more sense for myself. Because I see many guys, white belts, they know how to do berimbolo, they know how to do many things that can take long time to learn. And then the fundamentals, the base is not so strong. It is a bit tricky, i will love to see jiu jitsu strong at both sides. As a competition, like straight for fight and submit your opponent, not to get advantages and get the points. Just to fight to get the submission. 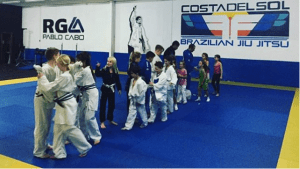 And at the same time to keep the same line for self defense and to keep jiu jitsu real for how to defend on the street, how to deal with situations that you have to be ready for. This is a bit different, so this is my opinion about that. Do you have any advice for our readers? Any tip that help people on the mat or real life. Yeah, like for me the main advice is to stick to the values of jiu jitsu. What jiu jitsu means for everyone, i mean whoever is practitioner of jiu jitsu. 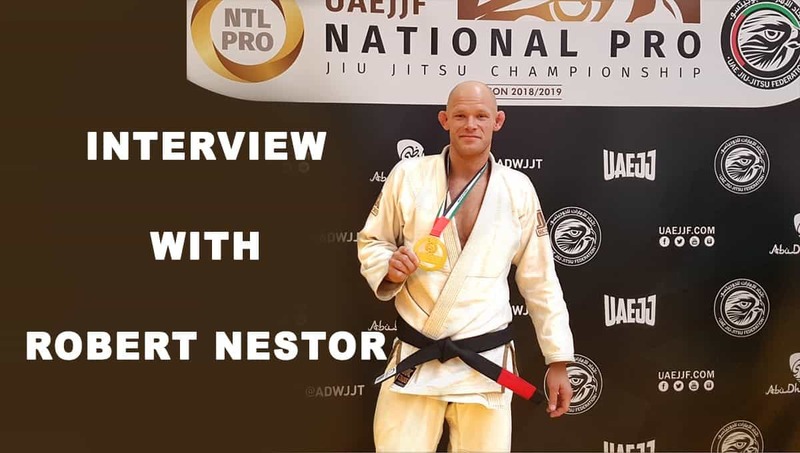 There are many values involved into jiu jitsu, respect, hierarchy, humbleness, many many things you learn on the mat it’s something you go through during the years. And then it’s something you can apply easily to life and I think it’s a good code of conduct for everyone. If you treat everyone with respect, if you are humble, it doesn’t matter if you win or lose. If you are good to everyone, you respect people, i think it will open a lot of doors and i think jiu jitsu can teach you all that. If you keep it real, keep it simple, you keep yourself humble, it doesn’t matter how good you are, but you always keep your feet on the floor, I think it will help a lot.